Japan Farmers Markets: Green Curtain Time! 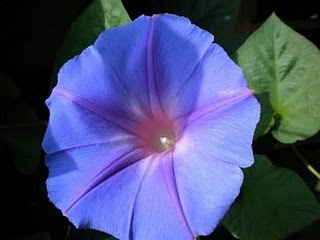 Morning glory (Asagao) blossom from a curtain. Lovely, isn't she? Lovely and idyllic as these spring days are the heat of summer is surely on its way. And with the shut-down of all of Japan's nuclear reactors, that also means conservation strategies need to be put in place now. And that can mean only one thing: time to plant the green curtain! I've written about this before in some detail, so I'm not going to set folks yawning with yet another telling. Instead, I'm going to suggest you get pen and paper ready to jot down a shopping list, and grab a ruler to measure the space you've got in mind for the green curtain to cover. Later we'll talk about recipes if you decide to do an edible version or recommended reading if you opt for ornamental and get lots of wild visitors. Edible or ornamental, the shade makes a lovely spot for sipping a wee bit of umeshu or umehachimitsu as those temperatures climb, too. Morning glory curtain shading west window. How to Construct a Green Curtain takes you through the whole process from start to finish with more detail than you might need, but I'm a worrywart. Green Curtain: Variations on a Theme talks about some fun edible options for curtain construction. Green Curtain Examples Around the City gives an all too brief tour of curtains large and small (gargantuan, in some cases) I've seen around town. I'm sure I'll see more this summer, too, and will post photos of the more interesting ones. And speaking of which, if you know of a great green curtain or have an idea for one let's hear it! Thank you for all the links!!! We used to have a green curtain in Ghana right outside our kitchen window (we would eat breakfast in the kitchen and the sun shone directly in on us)- the green curtain was exactly that- a curtain of greenery to keep the sunlight out. 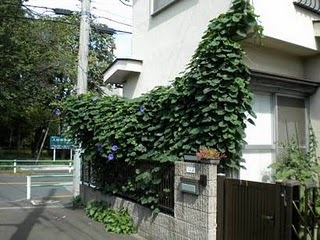 First a skeleton of thin fishing line was strung from roof out towards the ground- then the growing began- and it grew fast and furiously- creating a most wonderful green curtain! I *so* want to do a bit of a green curtain in my new backyard, but this year is a bit of a write-off because our deck is falling off the house and covered in building material for our inside renos! But I'm bookmarking this page and will use it next year. For sure! Anjuli, do you remember what it was? Edible or just leafy and shady? Lisa, I hear you. Think of all the fun planning and dreaming you get to do this year while surrounded by those building materials. It's going to be awesome! One of our favorites at home was Cardinal Climber. Beautiful lacy leaves with little red trumpet flowers that hummingbirds loved. Thanks for checking in!